As an actress, musician and journalist, Fayette native Alexandra Branyon has worked in and seen quite a bit of the world, but she found the story for her first film back home. “Treasures from the Rubble,” which has its state premiere Aug. 24, became a 12-year-long labor of love for Branyon. 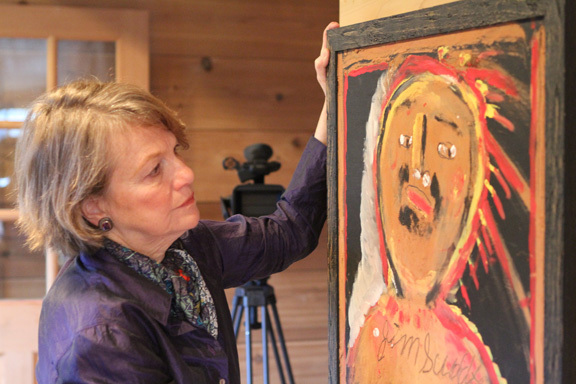 The film tells the world about the late artist Lois Wilson, whose desire to keep her lifelong assemblage of created and collected art safe led Jack Black, editor and publisher of the Fayette County Broadcaster, to create the Fayette Art Museum. Wilson studied art in Europe and New England, living and working most of her life in and around New York, but never gained much renown, and certainly no wealth. So she turned to Black, who was charged by Wilson’s drive to create art from found objects and by the vivid imagery she evoked. Wilson ultimately donated 2,600 pieces, some of them her own assemblages, others pieces she’d bartered from fellow artists. Black and Wilson’s collective efforts grew into a home for other outsider or primitive artists, such as Sybil Gibson, B.F. Perkins, Fred Webster and Jimmy Lee Sudduth, whose worldwide fame spread outward from that little town of 5,000 people. In 1980, Wilson died poor and still unsung, although assured her art had found a home. Black helped carry the museum’s story forward, winning acclaim from National Geographic and others, but Branyon felt their saga just hadn’t been captured the way she saw it: on film. “Treasures from the Rubble,” which she wrote, directed and produced, premiered in May at the Ninth Tupelo Film Festival, then went international in June with Toronto’s Female Eye Film Festival. On Aug. 24, the film will finally be shown at home, in the Fayette Civic Center that houses the renowned museum. Although she lives in Amagansett, N.Y., Branyon returned to her alma mater, the University of Alabama, around 2000 to receive a Distinguished Career Award from the Society for the Fine Arts. Over her life, she’s performed musical comedy for Joseph Papp’s Public Theater, played piano with studio bands in New York City and with a theater orchestra in Honolulu, and taught playwriting at the New School for Social Research, among other accomplishments. Black, who had been a mentor to Branyon when she edited the Fayette County High School newspaper, gave the introduction for Branyon at the Society for the Fine Arts banquet. Their talk afterward spurred the movie forward. Though she joined forces with editor Maria Maciak and composer Margaret Kitchings, who also played a ghostly Wilson-like presence in some memory scenes, Branyon had to assemble it as she could, learning about filmmaking along the way. It’s especially poignant to again see and hear some of the film’s main subjects, including Black, his wife, Margaret, and Sudduth, all of whom have died n in recent years, said Anne Perry-Uhlman, director of the museum. The Tupelo festival was an “unbelievable event,” Branyon said. Being accepted was one reason. The second was that because the filmmaker whose work preceded hers failed to show for a question-and-answer period, the festival emcee asked Branyon, at the last minute, to give a time-filling talk. Afterward, during what was to be Q&A for “Treasures,” her brother came out with flowers, then Alabama state Rep. Johnny Mack Morrow brought out an official resolution honoring the film. In Toronto, she scored a large crowd because the filmmaker whose work preceded hers was locally popular. “I had a big audience in Mississippi, but I just anticipated six people in the audience in Toronto; that’s not my neck of the woods,” she said. Interestingly, “Treasures from the Rubble” got nominated for best documentary, while the local hero’s work did not. Although she feared this Southern story wouldn’t play outside the region, the audience laughed in the right parts, she said, and swarmed her afterward, quoting back lines from the film to her. The party for the Alabama premiere will begin with hors d’ouevres at 6 p.m. Aug. 24 in the Fayette Civic Center, with a presentation at 7, and the film beginning at 7:30. It’ll be a red-carpet premiere, Perry-Uhlman said, in the auditorium, which seats 365. “We’re going to open a new exhibit with Mayor Guthrie Smith memorabilia, pieces of his that were donated to the museum, and we’ll be open for tours,” she said. Tickets are $10, and at press time, about half the seats were already sold. To reserve a place, call 205-932-8727 no later than Wednesday.